Positive mindset allows performance levels to increase because it facilitates direction and focus. The relationship between mental preparation and sport psychology therefore becomes important and there is evidence of its use in cricket, golf and tennis. It is therefore not surprising that coaching has also introduced sport science to their mapped programme of which sport psychology is an integral part. Given the contention that sport psychology plays an integral role within coaching it would be purposeful to argue of its merit for sports coaches in performance settings. One key concept that resonates closely with sports coaching is emotion and its impact during the training and competition settings. These training and competition settings will invariably elicit a range of emotions that have the potential to impact performers. Therefore, sports coaches need to understand the complexity of emotions and regulate these accordingly. Effective emotional regulation could lead to more effective and facilitated performance levels. The regulation of emotion can be understood through the theory of emotional intelligence (Goleman, 2004; Mayer & Savoley, 1990). Emotional intelligence has been defined as ‘the ability to monitor one’s own and others’ feelings and emotion, to discriminate among them and to use this information to guide one’s thinking and actions’ (Salovey & Mayer, 1990, p. 189). A closer inspection of this definition clearly aligns to the work of a sports coach. For example, coaches are in constant dialogue with their emotions in both favourable and unfavourable situations. A favourable situation may surmount to success in an important competition. An unfavourable situation may surmount to being eliminated from competition. Based on these situations the coach should be in a position to understand feelings and emotions of performers. The framework of emotional intelligence provides opportunities for coaches to engineer their own thinking and support performers they work alongside. Indeed, Mayer & Salovey (1990) suggest that those that exhibit higher levels of emotional intelligence are more likely to control their emotions and regulate these appropriately in order to support others. It is postulated that coaches who are in control of their own emotions will demonstrate positive body language and display effective verbal expression. Therefore, it is proposed that coaches should employ emotional intelligence to identify own feelings and that of performers that they coach and moderate these in accordance to each situation. In consideration of this suggestion, it would be purposeful to evidence previous research that has utilised emotional intelligence in different fields. Extensive research has been carried out on emotional intelligence within the last 30 years (Goleman, 2004; Petrides, Furnham, & Frederickson, 2004; Salovey & Mayer, 1990). The effectiveness of emotional intelligence has been largely evidenced through meta-analysis research carried out by (Van Rooy & Viswesvaran, 2004). Based on meta-analysis, it would be prudent to examine how emotional intelligence can influence sports coaches with evidence from other sectors. The business sector can demonstrate possible relationships that co-exist within coaching. One would expect sports coaches and business leaders to lead with a clear philosophy, demonstrate competency and control. Further, business and sports sectors share common goals that demand results and success. Arguably, one could resonate that business leaders and coaches who think ahead and act on impulse are likely to direct performers to change strategy and action plans. Research by Freedman (2010) highlights that leaders with higher levels of emotional intelligence are more likely to achieve greater sales, productivity, profitability, and customer loyalty. In substantiating this evidence further, Freedman (2010) highlights a number of research explorations related to business that identify how awareness, self-management of emotions, motivation, empathy and social skills contribute to greater effectiveness in business. Arguably, aspects highlighted in the research by Freedman (2010) give credence to their utility and purpose within coaching. Recently, Turner and Baker (2014) have also outlined how sport psychology can support the business sector to utilize transferable skills to increase performance levels. Therefore, this evidence states that a relationship between business and sports coaching can co-exist. The education sector is another area that resonates closely to emotional intelligence and sports coaching. For example, one key characteristic for sports coaches relates to guidance and support to foster learner development and progress in delivering success. To supplement this further, practitioners within education deliver excellence to their students to provide a pathway for future success with facilitated learning. A key determinant within education and sports coaching is motivation, which compromises both intrinsic and extrinsic values. To supplement the facilitative nature of motivation it is suggestive that practitioners utilize a mixture of strategies. Arguably, sports coaches require an inner self-drive to enthuse those that they are providing opportunities to succeed. The demonstration of communication is also important for sports coaching as both educators and coaches have limited time to communicate knowledge and raise awareness. Although this is a very short synopsis of the possible co-existence between education and sports coaching they are closely aligned to emotional intelligence. Within sports coaching it is suggested that coaches regulate their emotions by employing strategies to remain in control during pressure situations. A closer examination of emotional intelligence therefore is suggestive that sport coaching demonstrates alignment with emotional regulation. In making this assumption it would be ideal to propose the impact of emotional intelligence and coaching efficacy. One could argue that there is a close alignment between emotional intelligence and coaching characteristics including game strategy, technique and character development. Research evidence from Thelwell et al. (2006) has considered the relationship between emotional intelligence and coaching efficacy to determine coaching relationships. Thewell et al. (2006) identified characteristics of coaching efficacy aligned closely with emotional intelligence. The key emphasis of the research outlined that coaches whose levels of emotional intelligence was high were likely to support performers more effectively. The evidence presented above demonstrates co-existence and effectiveness of emotional intelligence within the business, education and sport sectors. In consideration of this, it has become pertinent to assess the potential relationship between emotional intelligence and sports coaching to enable opportunities to apply transferable skills within applied practice. In consideration of this, the purpose of the next section is to apply emotional intelligence to sports coaching. It is proposed that emotional intelligence will allow coaches opportunities to increase self-awareness of practices. Through self-awareness a coach could self-regulate their emotions and support players with motivation. Further, it is proposed that building empathy and addressing relationship management skills would facilitate effective coaching practices. The Daniel Goleman (2004) model of emotional intelligence contains five aspects that align closely with sports coaching. Given the flexibility of this model it provides opportunities for coaches to employ it through an interchangeable process. Therefore, an explanation of each aspect of the model and its influence to improve performance levels will be provided. To utilize this influence an emphasis on promoting the use of activities that could help increase emotional intelligence will be offered. One of the central tenants of the Goleman (2004) model is self-awareness, which is defined as ‘the ability to recognize and understand your moods, emotions, and drives, as well as their effect on others,’ (Goleman, 2004, p. 88). Self-awareness is an integral process as it provides a platform from which a core basis of the emotional intelligence paradigm is built. Arguably, to demonstrate and facilitate high quality coaching sessions one could postulate coaches require increased levels of self-awareness. Coaches who exhibit high levels of self-awareness better understand their own emotions and regulate these accordingly. Further, coaches that exhibit increased levels of self-awareness are more likely to assess and evaluate their own sessions and employ self-reflection. Therefore, coaches who are self-aware of their ability to communicate during coaching sessions are most likely to engineer appropriate responses from performers. Indeed, coaches who increase their own self-awareness levels are most likely to help facilitate and guide performers to increase performance levels. The process of increasing self-awareness could be formed from facilitative techniques and strategies. 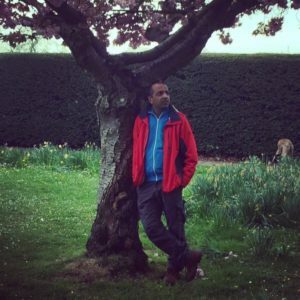 In raising self-awareness levels we are educating young and upcoming coaches the art of understanding their own behaviour and to regulate emotive patterns between themselves and their fellow peers and performers. Given the important context of self-awareness and its relationship with effective performance, it is proposed that coaches utilise the process of identification. Through the process of identification it is hoped that coaches build their own levels of self-awareness. 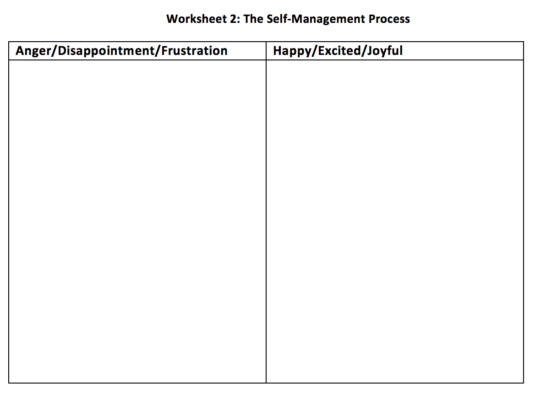 One example of raising self-awareness is through the process of identifying emotions and their impact during successful and unsuccessful situations as demonstrated by the worksheet below. It is recommended that sports coaches focus on thought processes, body language and expressions displayed to outline their emotions during positive and negative cycles. Coaches should compare and contrast various emotions to increase levels of self-awareness. To facilitate levels of self-awareness, it is recommended that coaches implement the use of reflective practice (Knowles et al., 2007). Reflective practice is pertinent as it allows coaches to identify their own strengths and areas to improve. In application, it is proposed that once emotions have been identified and a period of reflection takes place, opportunities emerge for coaches to implement strategies to facilitate applied practice. 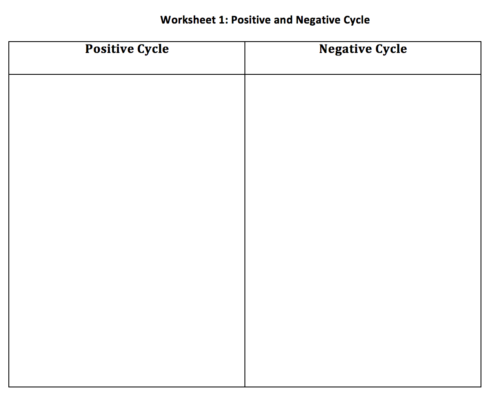 Through the use of the positive and negative cycles, it is further recommended that coaches utilize the practice of assessing their emotions on a consistent basis. The second aspect of the Goleman (2004) model is the self-management of emotions, which is defined as ‘the ability to control or redirect disruptive impulses and moods; the tendency to suspend judgment to think before acting’ (Goleman, 2004, p. 88). Managing own emotions is important because it offers a sense of control and the ability to think logically. Further, managing own emotions enables coaches to facilitate directive actions. Given the varied role of coaches it is unsurprising that they will exhibit a continuum of emotions from players. Therefore, sports coaches should employ strategies to facilitate and self-mange emotion. Research by Thelwell et al. (2006) identified that effective coaches arguably are those that can regulate their own emotions. In other words coaches who fail to regulate their own emotions will not be successful in controlling those of their players. Good coaches are more likely to be in control of their emotions and regulate these during appropriate situations on a consistent basis. To self-manage emotions the worksheet below is designed to allow opportunities for coaches to facilitate their own emotions. It is proposed that coaches facilitate opportunities to identify both positive and negative emotions within their own practices. The self-management process worksheet is designed for coaches to examine and assess reaction to both positive and negative emotion outcomes. It is hoped that coaches can through identified interpretation and raised self-awareness regulate and self-manage emotions in a reflective process. The third aspect of the Goleman (2004) model relates to empathy, which is having the ability to understand performers and their needs but also finding the balance with own requirements. A coach who demonstrates empathy with their performers would understand needs and emotions more effectively. Empathy is an important aspect and coaches should look at facilitating as many opportunities to support performers. Through the use of empathy it would be useful for players to know that peers are responsive to their needs and requirements. Building empathy in sport is important because coaches with higher empathy levels better understand performers. 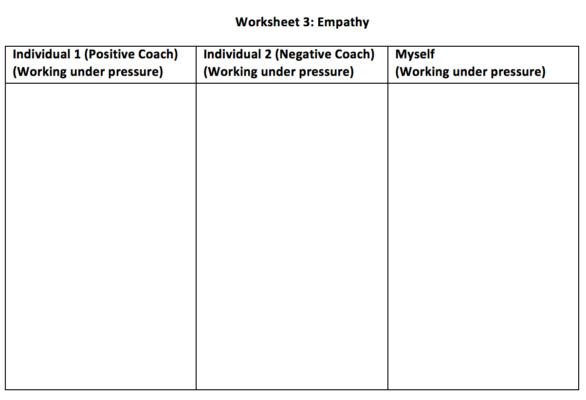 The worksheet on empathy is designed for coaches to better understand their working practices. In proposal, it is suggestive that coaches identify peers that they work with and assess how they relate to working under pressure. To facilitate this activity, it is proposed that the coach identifies two coaches (present or from previous experience) and assesses their empathy levels and emotion when working under pressure. Having considered this process, coaches should seek to understand their peer coach behavior and also how they would react to similar situations. This approach provides opportunities for coaches to examine their own levels of empathy in given situations. The fourth aspect of the Goleman (2004) model is motivation, which is defined as the inner self-drive to achieve goals. Coaches should be in control of their motivation to engineer motivational responses from performers. 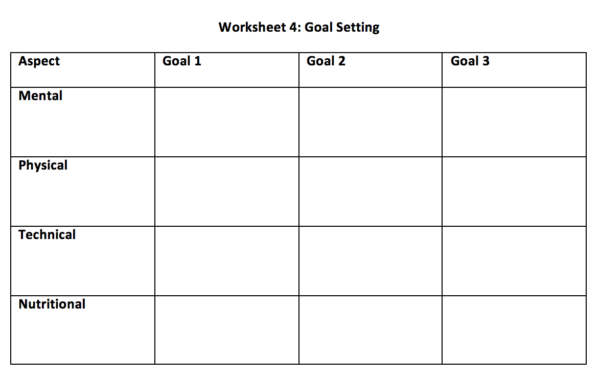 A popular strategy employed by many coaches is the use of goal setting. It is highly recommended that coaches employ goal setting that include process and performance goals in addition to outcome goals. It has been demonstrated that when goal setting is employed effectively it increases motivational qualities (Locke & Latham, 1990). Goal setting provides opportunities for coaches to direct focus and direction to increase motivational properties of their own working practices and performers. Given the value of goal setting, it is proposed that it should be employed to enhance levels of emotional intelligence and motivation. To provide opportunities to increase motivation levels the goal setting matrix has been designed to support sports coaches. The goal-setting matrix enables coaches to design purposeful interventions to enhance performance levels. To elicit short-term gains, it is proposed that coaches utilize the matrix on a three-week period. This short period will allow coaches opportunities to provide individual feedback. It is recommended that coaches introduce mental, technical, physical and nutritional goals to facilitate performance levels. Further, this matrix will enable coaches to focus on integral aspects relative to performance levels. The final aspect of the Goleman (2004) model is relationship management, which is the consequence of developing skills and strategies in managing others. Good relationships allow opportunity for effective team unity and group cohesion. Arguably, effective group cohesion increases the likelihood of success. Developing effective relationships with peers and performers is important as they can exhibit an array of differing personality traits. 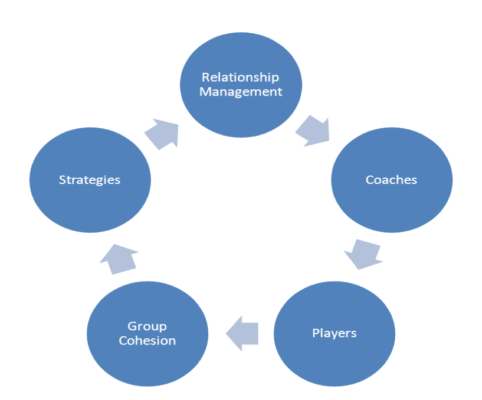 The management of relationships is important given the varied role of coaches that resonate from training needs, strategies, technical aspects and team selection. Foster effective relationships through engagement and reflective practice to enable coaches and performers to develop self-awareness. Implement varied training methods to encourage performers to facilitate problem-solving skills. Sports coaches are encouraged to implement transferable coaching skills from other sports to elicit different behaviours but also allow engagement within own practices. Allow opportunities for performers to engage with performance and social related activities to develop effective group building exercises to increase cohesion levels. The main emphasis of this chapter was to highlight the benefit of sport psychology and in particular emotional intelligence within sports coaching. Through enhancing levels of self-awareness coaches should be in a position to make applied practice more effective. In addition, sports coaches who increase their own self-awareness levels will facilitate effective self-regulation and emotional control. Enhanced levels of emotional intelligence would also enable the formation of increased motivation and regulated empathy. The rubric of emotional intelligence also allows sports coaches to develop effective relationship management to increase group dynamics. In summary, the evidence clearly stipulates the benefits of increased emotional intelligence to enhance performance levels. Knowles, Z., Gilbourne, D., & Tomlinson, V. (2007). Reflections on the application of reflective practice for supervision in applied sport psychology. SPORT PSYCHOL, 21(1), 109-122. Locke, E. A., & Latham, G. P. (1990). A theory of goal setting and task performance. Englewood Cliffs, NJ:Prentice-Hall. Petrides, K. V., Furnham, A., & Frederickson, N. (2004). Emotional intelligence. The Psychologist, 17, 574-577. Turner, M., & Baker, J. (2014) What Business Can Learn from Sport Psychology: Ten Lessons for Peak Professional Performance. Amazon. Van Rooy, D., & Viswesvaran, C. (2004). Emotional intelligence: A meta-analytic investigation of predictive validity and nomological net. Journal of Vocational Behavior, 65, 71-95.